school serving at-risk students statewide in grades 7-12.
worker and other family support personnel to help students stay on track. list of upcoming events, please visit http://ok.insightschools.net. 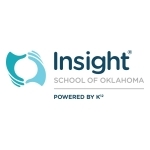 For more information about ISOK, visit http://ok.insightschools.net.